Belle Swersey enjoyed the Memorial Day parade with the Disney princess Elsa. One of those aspirations, recently shared with her by Belle’s father Jonathon Swersey, was to participate in a parade with a Disney princess to spread pediatric cancer awareness. Soon afterward, Arsenault began mobilizing others in the community to make Belle’s wish come true. Arsenault’s call to the City of Newton, where the family lives, was directed to Mark Kelly. The director of special needs for the Newton Parks and Recreation Department was immediately receptive to involving Belle in the city’s Memorial Day parade, despite having only two weeks to pull it off. Initially stunned by the act of kindness, Swersey and wife, Julie, then became concerned that Belle’s participation might detract from the rightful focus on the city’s veterans. Reassured that this special guest was most welcome, the Swerseys shared the good news with their excited daughter. 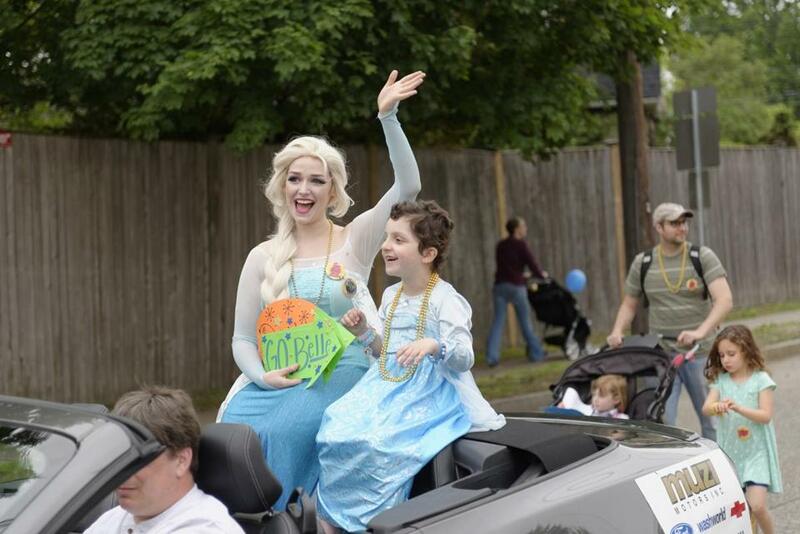 At the parade on May 30, Swersey said he had “never seen Belle smile that big, for that long” as she rode in a convertible with Disney’s Queen Elsa of Arendelle while her family and friends distributed information about pediatric cancer and the nonprofit organizations Lucy’s Love Bus and St. Baldrick’s Foundation. Swersey said his family was also touched by numerous signs of support along the parade route, personal attention from Newton Mayor Setti Warren, and numerous services donated by local businesses. While he said Belle continues to talk “nonstop” about the parade, Swersey has a wish of his own: to inform local officials of ways in which Newton and other communities can help families affected by pediatric cancer through local awareness efforts, fund-raisers, and advocating for increased research funding at the federal level.